to facilitate research in criminal justice and criminology, through the preservation, enhancement, and sharing of computerized data resources; through the production of original research based on archived data; and through specialized training workshops in quantitative analysis of crime and justice data. Users can download available data, analyze data online and also deposit data via a secure uploading process. Available data can be searched or browsed. 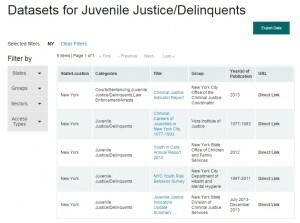 The browseable categories include: attitude surveys, community studies, computer program and instructional packages, corrections, court case processing, courts, criminal justice system, crime and delinquency, drugs, alcohol and crime, homicide studies, official statistics, police, and victimization. Whether searching or browsing the collection of data, the results page includes additional filters to narrow down along with selected list of publications relevant to the category being researched. On February 15, 2017, the Washington Post reported on an incident inside Montgomery County Jail in Dayton, Ohio on yet another shocking occurrence of police misconduct. In a video released by an activist, a detainee Charles Wade is being pepper sprayed at point-blank range while fully restrained in a chair. Mr. Wade filed lawsuit. The State of Wisconsin operates the Lincoln Hills School for Boys and the Copper Lake School for Girls, which incarcerate approximately 150-200 youth who are as young as 14 years old, in remote northern Wisconsin. The State routinely subjects these youth to unlawful solitary confinement, mechanical restraints and pepper spraying. Prior to state and federal raids on the facility at the end of 2015, staff also regularly physically abused youth in the facility. Currently, Wisconsin’s juvenile corrections officials lock up approximately 15 to 20% percent or more of the facilities’ young residents in solitary confinement cells for 22 or 23 hours per day. Many of these children are forced to spend their only free hour of time per day outside of a solitary confinement cell in handcuffs and chained to a table. Officers also repeatedly and excessively use Bear Mace and other pepper sprays against the youth, causing them excruciating pain and impairing their breathing. These practices constitute serious violations of the children’s constitutional rights, including their rights to substantive due process, as guaranteed by the Fourteenth Amendment to the United States Constitution, and their right to be free from cruel and unusual punishment, as guaranteed by the Eighth Amendment to the United States Constitution. J.J. et al. v. Litscher et al., No. 3:17-cv-00047 (W. D. Wis. Jan 23, 2017) (Complaint). ACLU, CAGED IN: Solitary Confinement’s Devastating Harm on Prisoners with Physical Disabilities (Jan. 2017). Erica Danielsen, Prof. Mushlin Testifies in Favor of Oversight in NY State Prisons, Pace Criminal Justice Blog (Dec. 8, 2015). Jason M. Breslow, What Does Solitary Confinement Do to Your Mind?, PBS Frontline, (Apr. 22, 2014). ACLU, Change is Possible: A Case Study of Solitary Confinement Reform in Maine (March 2013). ACLU, Growing Up Locked Down: Youth in Solitary Confinement in Jails and Prisons Across the United States (2012). We all were in the situation when we are looking for criminal justice related statistics without knowing where to look or where to even begin. No more. Hall of Justice, a project of the Sunlight Foundations, is trying to change that. Although not comprehensive, it contains nearly 10,000 datasets and research documents from all 50 jurisdictions, DC, US territories, and federal government. Its newly launched website offers searchable inventory of publicly available criminal justice statistics and documents in one convenient place, thereby improving transparency. The project explains its methodology in how and which datasets are included. You can learn more about the Sunlight Foundation criminal justice work here and the spreadsheet of datasets is available here. Users may search for available datasets and then narrow by state, groups, sectors (government, non-profit, private, etc. ), and access type (not machine readable, open, restricted, closed, etc.). The results display in a table listing the state/location, category, dataset title, group issuing the dataset, years included, and the direct link to access it. The major categories include: Corrections, Courts, Crime, Financial, Juvenile Justice, Law Enforcement, Victims, and Miscellaneous. All categories are further divided into subcategories. 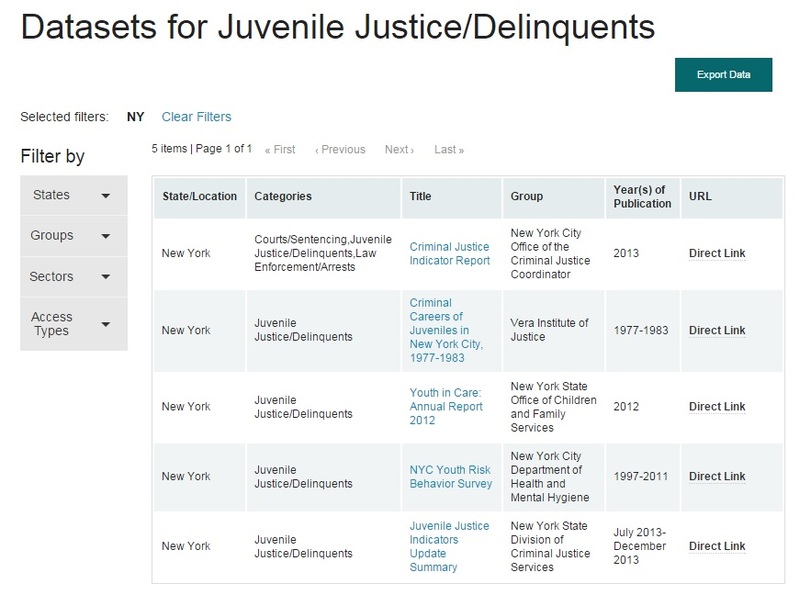 For example, the result page looks as follows (look to the left) when looking for Juvenile Justice – Delinquents datasets for the state of NY, listing 5 results with live links where the listed statistics can be accessed.